To Mulch or Not to Mulch? There is No Question! Don't forget the mulch when you're buying all of your spring time plants! 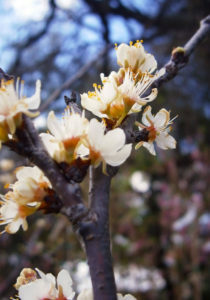 Mulch is one of the easiest ways you can keep your trees and plants healthy and happy. Mulch is an excellent insulator, keeping roots cooler in summer, warmer in winter, plus it keeps weeds out and moisture in. Not to mention, it looks nice! Mulch is available in many forms. Here at The Garden Center, we carry shredded pine bark, cedar, cypress and hardwood. There are also red and black dyed mulches available. It's up to you! All mulches are great, regardless of color or type. Some folks like to use different kinds for different purposes. Some say cedar mulch helps repel pests. Some customers have told us they like to use mulch made out of pecan shells because it keeps the cats out of the garden beds. The shells have sharp edges, which are hard on their tender kitty feet! Spread a layer in your garden beds after planting. A 1 or 2 inch layer is enough. For coarser mulch, you can put down up to 4 inches. For individual trees and large shrubs, make a nice little donut type ring around the base. For any planting, make sure to leave some breathing room around the base of your plant! 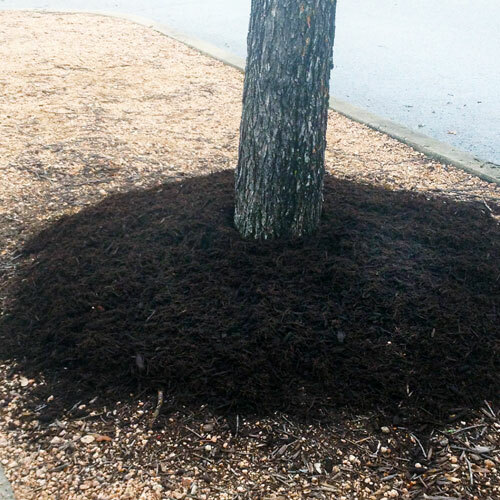 Putting too much mulch too close to the base can cause problems for your plants later. 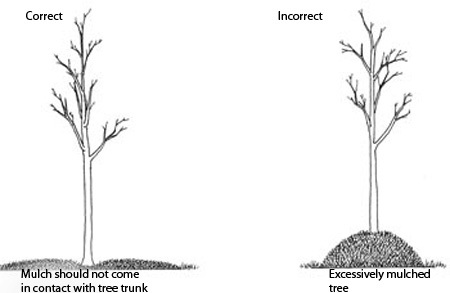 For instance, too much mulch around a tree trunk can trap moisture, allowing the possibility of rotting the trunk! 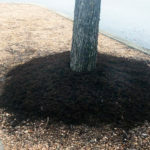 Unfortunately we see mulch volcanoes pop up every year around shopping centers and neighborhoods. Don't wait until summer to use mulch, it's beneficial to replenish it year-round. Weeds have a hard time making their way through it. You'll be using less water because you'll have less evaporation. You're also adding some good organic material back to the soil once it starts to break down. To mulch or not to mulch? There is no question!